Home IT Does it make sense for businesses to procure solar panels? Does it make sense for businesses to procure solar panels? Whether a data center colocation provider, a health care center or business park, organizations are regarding the benefits associated with solar energy with a grain of salt. Integrating renewable energy into the procurement process is admirable, but deducing how profitable such a move would be requires thorough analysis. While some specialists have asserted natural gas and oil prices will remain lower than the expenses associated with installing solar panels, others assert the latter power source will become more competitive in the years to come. Which energy source is cheaper? For enterprises, it's a simple question: "Should I continue to pay my utility bill or not?" Forbes contributor Chip Register acknowledged how five years ago, companies concluded that they were better off paying the monthly fee. Even though the U.S. federal government offered subsidies to utilities that installed solar panels, most firms still preferred to source energy derived from fossil fuels that were trading at incredibly high rates. However, the tide seems to be turning. Despite the fact that oil, coal and natural gas prices have dropped considerably, Register maintained that Chinese photovoltaic panel production combined with new advances in production techniques have caused solar energy rates to plummet. He acknowledged the following statistics. Citibank anticipates that by 2020, solar power will be just as, if not more, affordable than fossil fuels on an unsubsidized basis. Marketing analysis shows that by the end of this year, the U.S. will have installed 6.5 gigawatts of new solar energy - 40.8 percent of the total amount of solar power the U.S. currently produces. Because of solar power's volatility, businesses should be aware that current technology doesn't permit most entities from sourcing 100 percent of their power needs from PV panels. Quite often, organizations will aggregate electricity powered by utilities and green energy simultaneously, but this doesn't mean enterprises should disregard solar entirely. According to E&E Publishing, the Plymouth, Massachusetts, public school system garners 60 percent of its 8,000-student district's electricity needs from a 5.57 MW solar facility. The source noted the procurement has saved the educational body an estimated $500,000 in annual utility expenses. One of the biggest obstacles to installing PV panels on business park roofs is the expense posed by battery manufacturers. While these statistics apply to domestic implementations, The Week noted that each kilowatt of energy storage costs $600, meaning a 60 kilowatt hour battery will cost $36,000 dollars. Is such a battery going to last long? 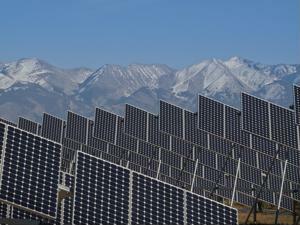 It will likely need to be replaced way before a solar panel's 20-year lifespan expires. Yet, this factor has only motivated researchers to develop more reliable, affordable batteries. Product Design and Development referenced a liquid battery formula created by Donald Sadoway and other researchers at MIT that operates at 200 degrees Celsius lower than previous solutions. Sadoway and his team asserted their invention will make industrial-scale renewable energy competitive with power plants fueled by natural gas, coal and oil. How does it work? The battery is comprised of two layers of molten metal separated by a layer of molten salt that serves as its electrolyte. Each of the three substances possesses its own density, allowing them to separate naturally. MIT's battery rivals conventional utility storage in that it doesn't require a hillside or water abundance to hold electricity (conventional systems require pumped hydro, which delivers 70 percent of power used to operate). The conclusion? It makes sense for businesses to install solar panels to supplement power derived from fossil fuels, but solar can't be leveraged as the sole source.